I was out to dinner with my partner last weekend at a busy restaurant when I dropped the contents of my handbag all over the floor. As I scrambled to collect my three lip balms, wallet, sunglasses, receipts from three years ago and half eaten mandarin, my partner collected something from the floor and held it out to me. I thought he had grabbed my phone. I was wrong. There, in the palm of his hand, was an unused tampon. It shone like a beacon of menstruation for all to see! The woman at the next table grunted ‘Gross’ in protest, making it clear that my tampon had turned her off her dinner. I didn’t need to look around to know that all eyes were on us. When it comes to menstruation, I’m no wallflower. I’m the woman who writes a weekly column about periods. I’m the woman who keeps a box of tampons on her desk, as one might keep tissues. I’m the woman who would never hide a tampon into her bra if she was going to the bathroom to use it. I’m the woman who does standup comedy about periods and makes menstruation jokes to strangers. Seeing my partner display my tampon so proudly was the moment that I realised that the open dialogue I have always engaged in about periods had rubbed off on him. 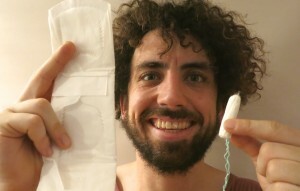 Here was a man who was proud of his partner AND her period. Here was a man who had no shame that his partner bled once a month, and felt no desire to hide from a restaurant full of people that it was happening to her right now. And, why would he? Why would anyone shroud periods with shame? At any given moment, it is estimated that 800 million women around the world are menstruating. Assuming that a woman menstruates between the ages of 14 to 50 years, women have their period 440 times in a lifetime, or the equivalent of 8.5 years of their life. By comparison, we spend 3.66 years of our lives eating. Or, in my case, 5.8 years because I like chips. Over the course of a lifetime, a menstruating woman will bleed more than she eats. For something that occurs so regularly for around half the world’s population, it seems odd that periods have become a dirty word, and even stranger that tampons can’t make any appearance outside of a woman’s handbag. Isn’t it time we all got a little more period proud? As I took the tampon from my partner’s hand at the restaurant that night, he smiled and said, ‘I thought you might like that I did that’. Anyone out there who has a partner, friend, mother, wife, girlfriend, colleague or daughter that bleeds (yes, that means ALL of you), show them your support by taking a photo with some sanitary products. We’d love to see your pics, so use the hashtag #periodproud. Fresh from Sydney Comedy Festival and sold out Sydney Fringe shows, Loani is bring her new show Loani Arman: Period to Melbourne Fringe, at The Courthouse Hotel, Sept 26 – Oct 4. For a bloody good laugh, book via her Facebook page or the Melbourne Fringe website. This entry was posted in Feminism, Health and tagged #periodproud, men and menstruation, menstruation, period, period pieces, period pride, period proud. Bookmark the permalink.